Breathing New Life Into The Watch With The JITWatch | OhGizmo! It’s pretty clear that watches are dying a slow death. The only reason they are worn is as arm decoration. But if German designer Martin Frey has his way, the JITWatch might change all that. 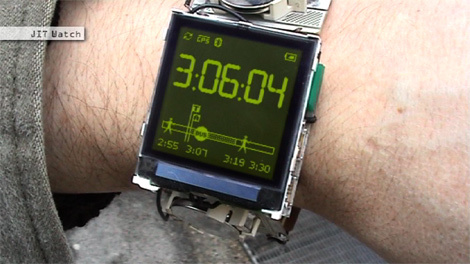 It’s being built around the concept of a “thinking watch”. It would connect to your Personal Area Network (comprised, mainly, of the watch and your cellphone, though it could include your PDA as well), and keep track of all the little things you have so much trouble remembering: When is my next appointment? Where does the appointment take place and how long does it take to get there from here? Thus, when should I leave? How much time is left till then? Should I leave now? Am I already too late? Once synced up with your cell, it could access your calendar and become aware of your schedule. The watch knows the wearer’s actual position coordinates via GPS, GSM-tracking or other techniques. In addition to that the cell phone enables a data connection with the www. Appointments with site coordinates can thus be synchronized. They were entered in advance e.g. into the cell phone or into the computer with a calendar tool like iCal. Furthermore the watch can access web-based navigation-, timetable- and traffic information services. Unfortunately, no availability or pricing information is available, though the picture hints at a wonky looking prototype, what with wires and batteries sticking out willy-nilly. So, maybe there’s so commercial effort behind the concept. Your caption put a picture of someone blowing into their watch to generate energy instead of buying batteries for the watch and doubling it as a breathalyzer. Eh maybe next week.